Are video games harmful for the brain? In my opinion,the video games are interresting but it is dangerous. I agree that video games are harmfull for our health if we use them exessively. I think that it is a great subject because we use a lot our phones. I agree that video-games is good for the brain and this article is very interesting and constructive. I agree that do not abuse video games. It seems to me that very important to say because can be dangerous. If you ask me, I knew this since 2014 but it's not for that people stop stereotypes about players of video-games. I believe that it's true . I do not believe that because I play very longue time and I am not obesity. I agree with you that video games are dangerous for us, if we abuse it. I do not believe that, it's incredible! 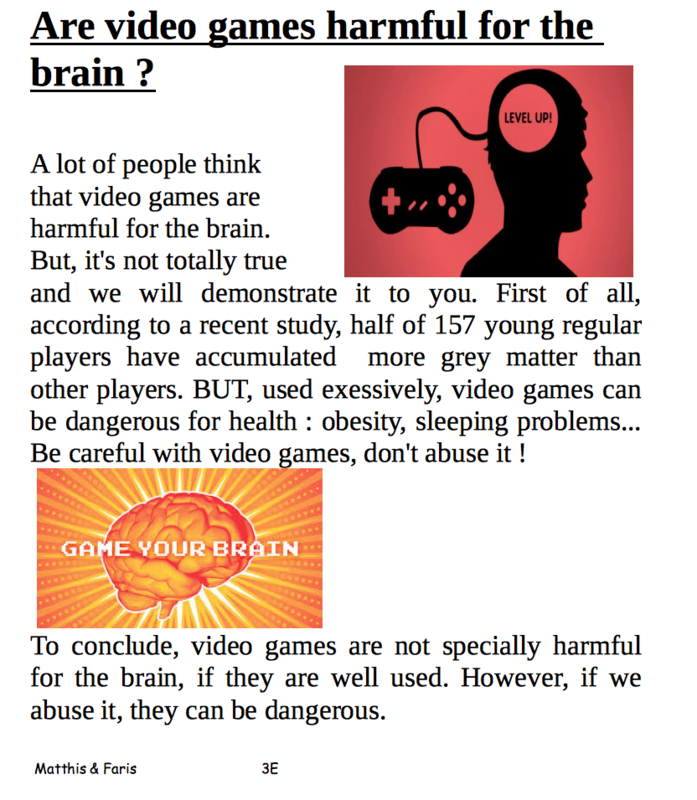 In my view , video games are harmful because they are dangerous for your health. It seems to me that video games are harmful for the brain. I would argue that it's great article because we spend time and our phones. I would argue that play at video game reasonably isn't dangerous, but play with excess is bad. The health is degraded by every excess. In my view, this vidéo games is not dangerous but if we stay too much they can harm our health. As far as I am concerned I think that videogames are not dangerous for the brain if it is well used.